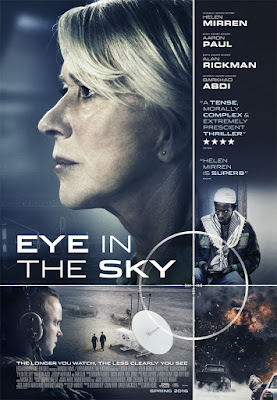 'Eye In The Sky' is a thriller that takes a close look at what goes through when planning to use an air strike against most wanted suspects. It is set up to be a thriller filled with dilemmas as the military and major powers look to carry out this attack legally and as safely as possible. But in a film like this it needs to get you really engaged and make you question what you would do if stuck in this tricky situation. So would 'Eye In The Sky' be able to create the tension needed to tell such a morally complex story or would it be a bigger disaster than one of their missiles would cause? 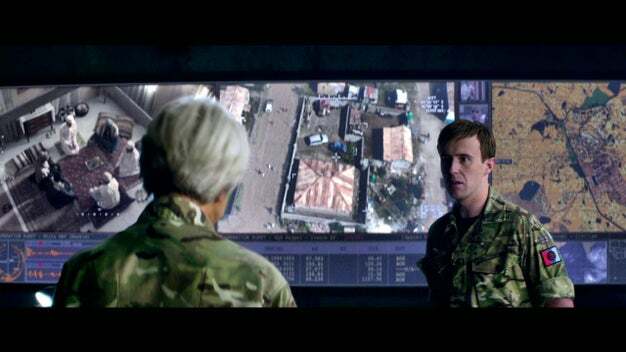 'Eye In The Sky' follows the plans to carry out a drone strike in Nairobi, Kenya to take out some of their most wanted targets. It gets a lot more complicated as Lieutenant Genreal Frank Benson (Alan Rickman) and Colonel Katherine Powell (Helen Mirren) struggle to get clearance to carry out this mission from those who would authorize the attacks. The biggest roadblock of all comes when a young Kenyan girl is in the blast zone and it takes a lot of debate from those involved to whether or not they should carry out their plan. When you go and see this film, be prepared for one of the most morally complex films you will ever see. The film is filled with scenarios that really makes you question what you would do if you were stuck in this tricky predicament. A real dilemma that shows how tough it can be for the people in these jobs to carry out. The film has many twists and turns that makes every decision debatable and quite a struggle to determine what would be the morally correct thing to do. 'Eye in the Sky' will most definitely cause debates afterwards when talking about what your choices in these scenarios would be. EITS is filled to the brim with brilliant performances. This is even more impressive when considering a lot of the time, the main characters are contacting each other via telephone, video chat and also just sending messages to each other. The main characters are never really in the same room as each other with all dotted about in different locations such as bunkers, head intelligence offices and even to on the streets of Nairobi. Helen Mirren is magnificent as a quick decision maker and thinker whilst the plans for this attack is being planned. Her no nonsense attitude is highly entertaining and provides us with a great character who does pull out some funny moments with her reactions. Helen Mirren was great once again! Alan Rickman most definitely deserves praise in what was unfortunately one of his last roles. He provided a fantastic performance as a calm but eagar Lieutenant who knew that something had to be done and quick. Fully aware of the dangers, he is great to watch as he debates the points to strike as soon as possible. This leads to fantastic performances from the whole cast who are watching the events unfold from a secure office in London. Amongst the Lieutenant are members of the legal counsel and of the UK government. There are great scenes within this room as they debate the legal and political views surrounding the aftermath and it really grips you when it so easily could lose you. A performance from Aaron Paul should most definitely not go unrecognised. 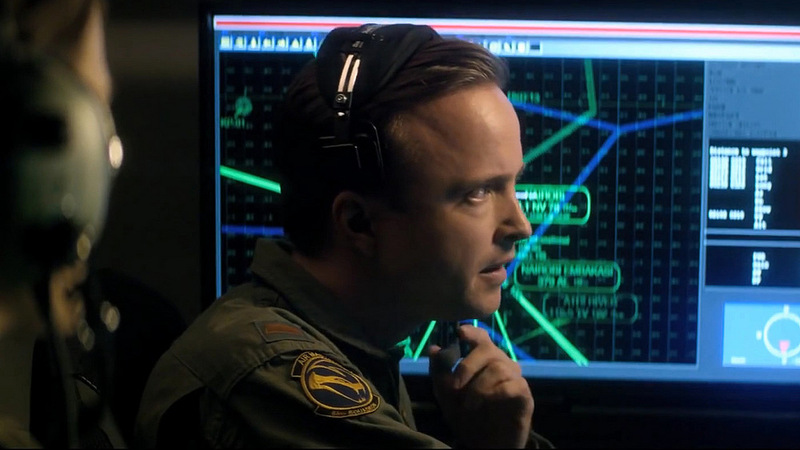 His part in this mission is actually setting up the drone and launching the attack. There are many times that he is debating with himself whether or not it is the right thing to do. His character is the one who recognises the young girl and immediately feels a lot of grief about being a part of this attack. Paul does fantastically here to show how unsettled by this and his actions show so as well as he looks to give the girl as much time as possible to allow her to be clear of the danger. We talked about moral complexity earlier but it is perhaps most true for Paul's character Steve Watts in many scenes of the film. Another great thing about the film is how emotional it can be. The ending ends up with you panicking and so desperately wanting everything to wind up being ok. It really plays to your emotions and is so filled with tension. The movie in fact may effect you in quite a sad way which was most definitely the case in my screening of the film. Once the credits started rolling and I was about to leave, I noticed a woman sitting a couple of seats from me was sitting with her head between her legs. It stayed this way for a long amount of time as her partner consoled her and it was clear to see that she was distressed by this film. Some powerful stuff throughout this film with the credits not helping the emotions either. The film is filled with many roadblocks throughout the film. The actors do a great job of acting frustrated at these constant setbacks. Being perfectly honest, it does have an effect on the audience as well. A couple of times, there were groans of disbelief as frustration started to affect the audience. It can be like this at times but nothing too bad to take you out of thee film or be fed up at all with it. A tense filled and morally complex film, Eye In The Sky is most definitely worth checking out! So have you seen 'Eye In The Sky'? If so what did you think of it? I hope you enjoyed it as much as I did! If you haven't seen it yet, I hope this review maybe convinced you to go see it. Once again thank you so much for reading, it is much appreciated!